My Family Fun - Monsters University Sulley Infant Costume Make your baby's Halloween monstrously fun! Make your baby's Halloween monstrously fun! 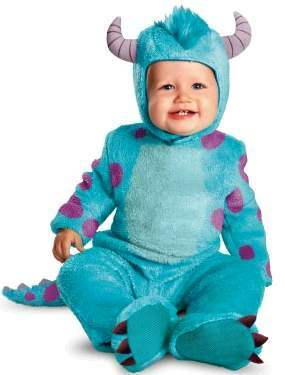 To look just like oversized blue monster, Sulley, from Monsters, Inc. and Monsters University, this baby costume includes a detachable tail, headpiece and furry jumpsuit. With Sulley's signature blue fur, purple spots and pointy horns, this costume is perfect for fans of both Monsters, Inc. and Monsters University.